Elizabeth Venart provides consultation to counselors at various stages of their professional development. Her approach to supervision is, like her counseling style, rooted in a humanistic, relational framework. 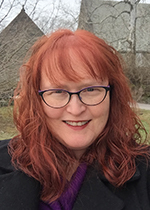 Elizabeth Venart has been providing on-site and adjunct LPC supervision to clinicians working in diverse practice settings for over fifteen years. Her approach is rooted in a humanistic, relational framework. While she draws upon her experience and training to provide clinicians with a variety of concrete strategies to strengthen their work, her primary focus is on the quality of the relationship between counselor and client—and any obstacles to empathy and mindfulness. From there, Elizabeth invites counselors to listen deeply to clients and their stories and to trust themselves and their intuition more fully. Understanding the influence of practice setting challenges, I provide LPC candidates with a supportive environment in which they can be authentic, share their struggles and triumphs, cultivate a trauma-informed perspective, and promote resiliency in themselves and the people with whom they work. A Licensed Professional Counselor (LPC) in Pennsylvania, Elizabeth Venart is eligible to provide 100% of the required supervision hours to LPC Candidates and fifty percent of the required supervision hours to Marriage and Family Therapist and Clinical Social Work candidates.